Last Friday I went to the Black Sheep Gathering in Eugene @ the Fairgrounds and had an opportunity to take a class from Sandoval McNair on felting yardage for a vest. I’m gonna just say it was an awesome class. The class was really fun and relaxing. It’s an ancient way of making material for just about any use possible. From an artistic point it was like painting with fiber. The colors of roving we were able to choose from came directly from Sandoval’s personal cache. 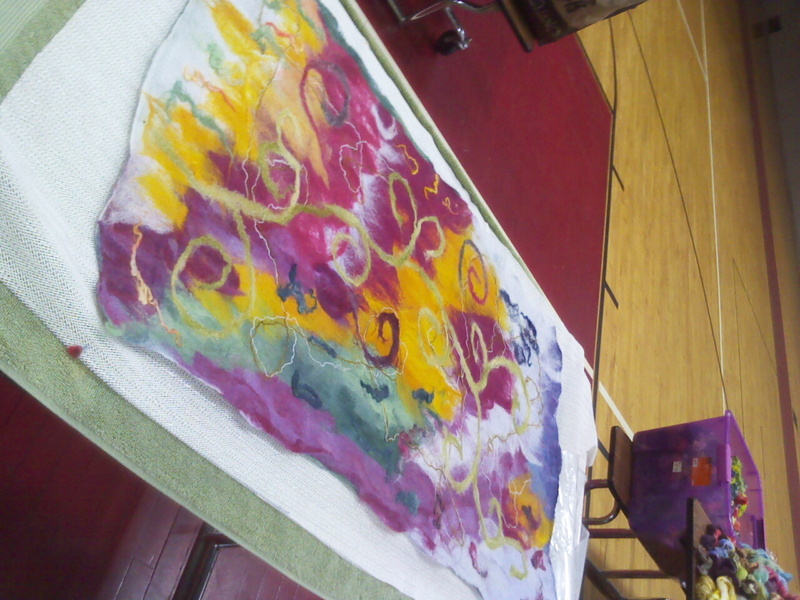 She is an amazing fiber artist & does her own dyeing. Which made the materials even more unique and fun to play with! I bought a few new colors of roving at the fair to play around with at home and so far have been really happy with the results. Like I needed another hobby! Today I woke up thinking about printing in 3+ colors. And throughout the day this stamp kept popping in my head. That’s right, the Love stamp featured on Mr. Rogers neighborhood from the trip to the post office where we learned about printing stamps. 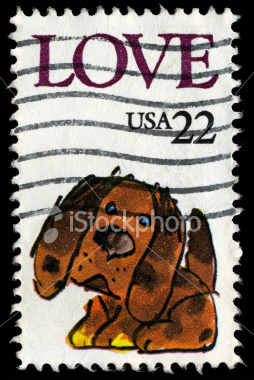 This is quite possibly the best stamp ever. End of story. This morning I very nearly maced the neighbor dog. Not out of any malicious intent, he just happened to scare the well… you know… out of me. 6 o’clock am, I am pulling back into my driveway after workout. Its still pitch black and I am bleary eyed… thinking about a warm cleansing shower and oatmeal for breakfast. As I pull into the drive I hear a dog bark, and somewhere in my head I think “that sounds closer than Schultz” (the north neighbors German Shepard). I open the door and there he is… a big furry German Shepard dog head. I shrieked and slammed the door shut. Did I mention it was dark out? After realizing that el doggo has no malicious intent, and then feeling foolish for my very very girly shriek, I opened the door to say a proper good morning to him. But doggo was nowhere to be found. I fear he may have gone home to nurse a perforated ear drum. Last weekend was sunny and beautiful, but carried with it little joy. We had the hard job of saying good bye to our Beagle Abbey. She was almost 14 years old, and was suffering from nothing more than the break down that age brings to small animals. It was difficult to do, but she was finally telling us that life was not comfortable to live any more and we had to respect that. This is the first dog that my family has had, and has lost. Most people have experienced that loss at an earlier age than I have. I dont know if that is better or worse, I just know its a really sucky thing to have to go through. At any age. Abbey came to us from friends. People we knew had bred their female and advertised puppies. When my mom called she recognized the voice and we knew that we were getting a pup from a good home. She was a funny little pup, not much bigger than would fit in one hand. When she came home I was instructed to not let the dog’s whining keep anyone awake. No matter what! I slept on the floor that night with her, and was terrified that I had smothered the puppy when in the morning I found her at the bottom of my sleeping bag. Thank goodness it was a false alarm! But she always found her way to the bottom of sleeping bags from that point on. Abbey was part of our family. For 14 years she went everywhere with us. And when I moved out of my parents home she was decidedly sad about it. By the time I could have a dog of my own she had bonded so deeply with my Mom that moving her to my house was not even an option. In fact she seemed to hate visiting my house. After the first 5 minutes she would go sit by the front door whining to go home. She had become accustomed to a higher level of living than I have. Funny, but very true. Abbey opened our heart to dog love. In fact she is the one I credit with cracking my self proclaimed non-dog lover grandmother. Grandma now proclaims that she loves only the dogs related to her. My dad who insisted the new dog be an outside dog only turned into the guy who would share his pillow with the dog in order to keep her comfortable. And my mom was finally able to truly explore the dog loving side of herself that had been trying to satisfy itself with cats for so many years. 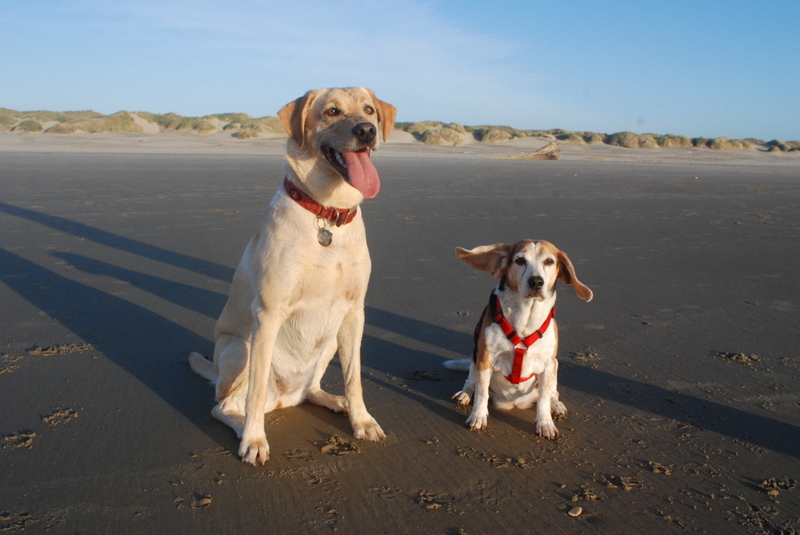 I know this beagle sized hole in our hearts will heal with time and with love from the current dogs. In fact there is a sweet little puppy at my parents house who is doing her best to keep everyone amused with her antics. But in reality the new pup will never be an Abbey replacement. And that will eventually be ok. But right now its ok to miss Abbey like crazy, and shed a tear every so often for our lost family member. Every morning at work I see this little note in our shared kitchenette/utility closet. It makes me smile. And I think… yeah, thats about right.